This interview took place on: 12/8/11. Jesus freak Hideout (Scott Fryberger): I'm just gonna jump into this by asking this: what is your role at Slospeak? Davy Baysinger: I pretty much just oversee everything. There's a guy named James Cross, and he funds the label and kinda helps support it in that sense. And he just kinda handed the reins over to me. I don't know how you'd officially word that. Head of office, I guess. President of the United States of Slospeak? Davy: And we have a pretty small staff. There's a total of five of us, not including James. JFH (Scott): Wow. That is pretty small. Davy: Yeah, it's small, but it's good. One thing we have going for us is that we don't really have the legacy of an old business where you kinda have to do things the old way. We're pretty quick on our feet, which is good. There's a ton of things changing in the music industry, you know? And we're able to move quickly with it. JFH (Scott): Can you tell me about the formation and the recent evolution of Slospeak? Davy: Yeah, it all kinda started with a label called Eden Records. And that was a label that the two bands on our site had already started with. Those bands are Blood and Water and Pioneer, who used to be called News From Verona. James started the label out in San Francisco. And Blood and Water actually called me to do graphic design, 'cause that's what I've been doing for the last few years. As soon as I got out of Bleach, I started working at a record label doing art for Rambler Records. They had bands like The Wedding and Deas Vail and a guy named John Davis, I don't know if you remember him--from Superdrag. And that's kinda where I started. I've been doing graphic design stuff, actually since the beginning of Bleach. So anyway, Blood and Water contacted me, 'cause I had done the last couple Relient K records, and they contacted me to do graphic design for their record. And in that process, I was talking a lot with the band, and I feel like God's always kinda put that on my heart to minister to bands and - I don't know, more than anything I just wanna share what I've learned and hopefully lead younger bands away from the mistakes I've made. So we spent a little bit of time talking about the graphic design, and then hours talking about different situations with the band; where they're at, what's going on with members of the band and whatnot. So we got that project done, and then I spent probably two or three months where I just kinda disappeared from everybody there, and then I got a random email from James asking if I wanted to talk that week. I said sure, and we got on the phone and he basically just asked me if I wanted to do this. And it's funny, 'cause my initial response was "No, not really." It's a horrible time to start a label, you know? It's just the state of the music industry. So yeah, I was like "No...I don't think so. Sounds kinda like a grave really." *laughter* So we talked about it, and he just kinda shared his vision of what he wanted it to be, and it matched 100% with my vision of music, and at that point I felt like it was way worth a try. It actually sounded pretty awesome. His vision was to basically raise up bands who have a real relationship with God. It's not necessarily that they're the most CCM thing in the world, but we wanna make sure they're walking with God. Not "make sure," but we wanna foster that. In my experience, though [Bleach] had some great labels, we didn't get much spiritual guidance, which is tough when you're touring. You don't have your local church because you aren't home to go to church. So yeah, raising up bands in that sense, and then hopefully the band will reach outside themselves and give to causes that are bigger than themselves. That's a thing that we're still kinda working on a little bit. And then third, to use your platform for something that is positive for other people. Raise up little Switchfoots; you know, bands that also affect culture. So anyway, I was down with all of those; it actually hit right on the head of what I believe in. More than anything, I believe music moves people and sometimes even changes the course of someone's life. I believe music still does that, and I want to be a part of that. JFH (Scott): And why the name change from Eden to Slospeak? Davy: A big part of it is that I feel like we became something a bit different when I joined. The Eden name is still there, and it's kinda the overall parent company, I guess. Also that label name is gonna be reserved for any bands we may have that are really, really focused toward CCM and that's all. So it's still around, and Slospeak is kind of an extension of that, and it's a little more focused directly on rock and indie music. Not necessarily your AC, CHR stuff. But we're still Eden. I don't know, does that make sense? JFH (Scott): If I were to make a comparison, it would be like Eden is BEC and Slospeak is Tooth & Nail? Davy: Yeah that's a pretty good comparison. At this point, Eden doesn't have any artists because we're really focusing on the Slospeak side of things. I feel like that's where God's got us. But yeah, that's a pretty good comparison. A little different but that's the general idea of what it is. JFH (Scott): So you guys have Blood and Water and Pioneer signed. Do you have anyone else? Davy: Yeah we do, but we haven't announced it yet. By the end of this year, we'll have two more artists that we'll have announced (Note: They've since been announced: Owen Pye and SONS). And we're really excited about it. But yeah, Pioneer and Blood and Water are the two main ones right now. Actually, Pioneer has a record coming out in like the middle of January, and we're really excited about that too. It's gonna be awesome. JFH (Scott): Do you accept demos from artists looking to sign? Davy: Yeah! Yeah, for sure. We're always looking for new bands. I think that's one thing we talk about in our staff meetings everytime - what good music have you heard out there? And I think I would say to aspiring bands to just be as creative as possible and work as hard as possible. The things we look for in a band is obviously a band that writes great music and creative music. A band that's not just a carbon copy of everything else that's out there. And secondly, a band that wants to work hard, 'cause that's really what it takes. It takes some touring. We definitely look at bands that tour a little more seriously, especially if they have a proven track record. And then thirdly, if you want to affect people with music, then you have to be affected on a deeper level spiritually. That's another thing that we definitely look at. JFH (Scott): I'm gonna backtrack here a little if that's okay. When did you say you were gonna announce the new signings? Davy: Both of our new artists are gonna be announced before the end of the year. I can't remember the specific dates. I think one is gonna be announced by the end of next week. And then the other will probably be announced at the end of the next week. So in the next couple weeks, we'll have doubled our roster. Davy: Yeah, it's cool! And great music too, man. I'm so excited about it. I talked with Blood and Water recently too, and their music is gonna be - I mean, it's already good, but it's gonna be that much better. JFH (Scott): I saw Blood and Water a couple of months ago, and I was talking with Brad [Hagmann], and he told me about their new EP coming out. I'm stoked for it, 'cause In Character was a very good album. Davy: Yeah, I think In Character is a great record with some great songs on it. And in a live setting, those songs take on a great life, for sure. JFH (Scott): Yes, definitely. 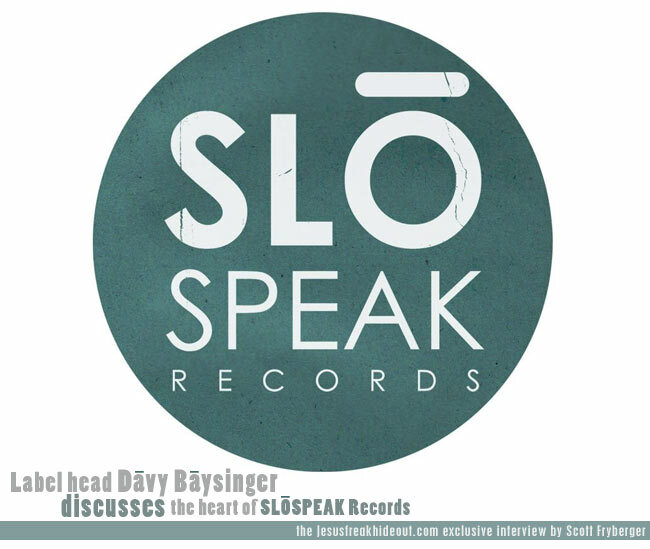 Do you think Slospeak will be working toward major label distribution anytime soon? Davy: We've talked about those kinda things, and we have some opportunities set up, but we're kinda small at this point. We're doing something new in the sense that all of our bands are new and our label is new. I mean that doesn't mean that we're not gonna get bigger. That's the plan, obviously. But music is in a weird place. Most records are sold digitally now, or not sold at all but just stolen. Most people, unless they're just really into it, don't go to stores to buy CDs anymore. And with physical distribution, you have to sell a certain amount to the store, and then if the store doesn't sell all of them, you have to buy them back. So there's a huge risk. So, all that to say, yes, we have relationships that can get us major label distribution, but we're taking it slow. We don't wanna just jump on that because we can. We want it to make sense. Plus, it's not really as important as it used to be. JFH (Scott): Other than the new signings you'll be announcing, what else does Slospeak have coming up in the near future? Davy: Well, in addition to the new signings, Slospeak will have at least four new releases in the coming year, if not more. So we're just gonna be looking for new bands and pumping albums out. Trying to make things happen. We're also talking about a compilation that we'll put out with our bands and then possibly some other bands that are indie that we really love that are putting out good music. JFH (Scott): That sounds like it'd be cool. Well, I know some people would be a little upset with me if I didn't ask you this, so what's the current status on Bleach? Davy: Well, it's crazy, 'cause we kinda shot ourselves in the foot and made ourselves look like fools saying all this stuff we were gonna do. *laughter* The reality is that everybody is really busy; Sam [Barnhart] is up in Chicago playing for his church, and that's going great; I see Milam [Byers], Jared [Byers] and Jerry [Morrison] at least once a week, 'cause they live here in town. Milam is doing The Reversal, which is a ministry that reaches out to artists that are touring full-time (thereversal.org). It's pretty awesome. We meet up weekly here in Nashville. Jerry and Jared have full-time jobs, and I'm running this label. So everybody's pretty busy. It's just a matter of finding the time to do it. We definitely talk about it a lot. There is a tentative plan for something to come out. It might not be the full-length record, but something for possibly August of 2012. We're still trying to work out the details of that. As for a record, we just want it to be good. Finding the time to get together and make it as good as we want it to be is gonna be tough. At this point I would say that there is no release date, but it's definitely something we're gonna do. It's just a matter of being able to get it done. A year and a half ago, almost two years ago, we tracked like four songs at Mark Townsend's studio, and then we all decided to just keep writing. We talk about how we want it to be good, and we're telling everybody this. People will get it and say "Man this isn't that good." *laughter* Hopefully not, but that might be the case. But more than anything, man, I'm just excited about where God's got me, and I feel like, in a lot of ways, Bleach was a preparation for what I'm doing now. You know, He prepared me to speak to artists, and kinda run this label. And so, more than anything, I need to be true to that. I definitely never wanna live in the past. I mean, Bleach was an awesome thing, and He used it in an amazing way and there were a lot of good things that happened. I'm grateful for it, and honored to have been a part of it. At the same time, I know that was preparation for what I'm doing now, and this is probably preparation for what I'm gonna be doing next, you know? But right now, this is where I'm at. JFH (Scott): Alright man, well that's all I had for you. Is there anything you'd like to add? Davy: Yeah, check out Pioneer. Their new record is coming out on January 24. Their new single that's out was the number one most added single to rock radio last week. So I'm stoked about that. Check out Blood and Water if you haven't already, and stay tuned for the new stuff coming down the line. We're really into the idea of giving our artists an old-fashioned kind of push, you know? And we wanna mix it with the same kind of heart as a label like Come&Live! I love that label. Chad [Johnson] is awesome. He used to work at Tooth & Nail, where Bleach was for about three records. Also, we want our artists to feel comfortable being original. We don't want to push them into being a copy of a copy of a copy of a band that was popular in the 90s. We don't want them to be another TobyMac or Skillet or whoever else is popular, because those bands are already doing their own thing, and that's cool. That's one of the biggest problems with our industry; lack of originality and freshness. I went to the Dove Awards a couple years ago, and the people who were presenting awards and the people who were winning awards were the same people who were presenting and winning in the late 90s. And that's fine, but it's also kinda disappointing. I think we need to bring up bands that are just being true to themselves, and not necessarily doing what is popular. I don't know if you feel the same way or not, but yeah. JFH (Scott): Oh definitely. I think one of my biggest pet peeves is when band's make boring or uncreative music, but claim it's okay because they're making it for God and not for the listeners. It's like whoring out their music to make a quick buck. Davy: Yeah! That, and it's also like whoring out God, which is even worse. But yeah, we don't want to pressure our artists to change up their sound at all. I mean, even when we were in Bleach, we got some pressures. I don't think labels necessarily think about it like that. I think they just want their artists to be successful, and they know how to build success. But I mean, if you do things like putting "Jesus" in a song just so you can get radio play or sell a record, that's honestly just dirty. In a sense, it's blasphemy. You're using Jesus' name to sell a record. And if you dumb down a song too - it's like "Okay, make this verse more simple, make this chorus more singable, and add some 'I lift my hands up' and some 'I'll love You forever' lyrics in there, and dumb it down a little bit and the church will grab ahold of it." And that's just sad, you know? I think every band has a unique calling. Especially if it's a band of Christians. They have a completely unique calling from the next man. For us to try to funnel it down a pipeline because that's what works - I mean, there might be some of that that can happen that makes sense, but to try to turn a band into the next Skillet or whoever is just wrong. But yeah, it's good to hear that from someone in the industry. Good that you're feeling the same thing, because I think it's time for a change. It just is. I mean, everything is broken in the music industry. And from my experience, and even reading through the Bible, that's when God rebuilds. That's when He makes things new, you know? It's when we're at the very bottom that He's actually able to shake us up and recreate something that's better than we could've imagined. And I'm not even talking financially, just better than we could've imagined in that we're making good art that's pleasing to Him, you know? And there's definitely backlash when you try to do something different. I mean, for Bleach - we weren't even really that unique. But there were times where we were totally going for something, and we nailed it - okay, here's an example: we want these drums to sound really raw, kinda dirty, not really clean and overproduced. And then we get reviews back that say the drums sound like demos, and that we could've gotten better drum sounds. It's like, no, we got the sound we wanted. And it's fine, I get that. It's gonna happen. So there's definitely backlash when you try to do something different, but at the same time, if you nail it people are gonna say "Wow that's really good." And hopefully that's what will set Slospeak apart - that we're doing our own thing. Check out what's going on with Slospeak Records at www.slospeak.com!